While analyzing the variant of Downadup/Conficker/Kido , I setup my analysis lab to know how exactly it attacks on other machines in LAN. So , I infected test machine “IP 192.168.1.7” and then run the sniffer like wireshark. As you can see in following image on successful connection to port 445 (SMB)of 192.168.1.6 , it is trying to send “NetPathCanonicalize” request by SRVSVC service ( Ms08-067 Vulnerabilty) See packet 113. I found, after infecting the machine, it creates local http server (random port) to distribute the malware .To infect other machine, it’ll send the same URL to victims. But you cann’t see that request in packets “Path Query” in “Netpathcanonicalize request” as it is encrypted!!! 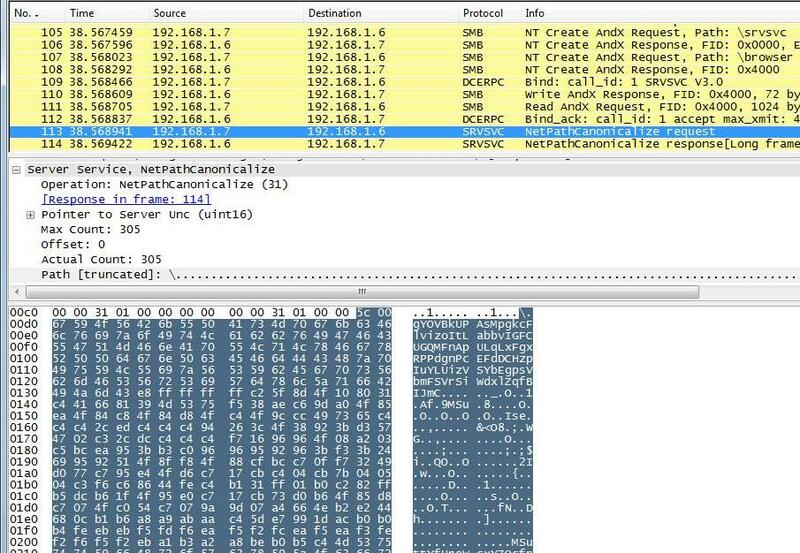 How do i came to know ..
Answer—>>There is decyption routine in this packet itself .. see below this is data of packet 113. 1. It’ll exploit the vulnerabilty. 2. Successful exploitation results execution of payload. Infected machine had already opened the random port 6216 to spread malware. the string “ewflztq” is randomly generated for a particular session. From that location it downloads the copy of malware and do execution. This entry was posted on February 1, 2009 at 5:27 pm and is filed under Uncategorized with tags Analysis, conficker, Domain List, Downadup, kido. You can follow any responses to this entry through the RSS 2.0 feed. You can leave a response, or trackback from your own site. Thanks for the detailed analysis. Not only can this virus disrupt your PC, since it can disable your ability to connect to software update sites it leaves you vulnerable to even more malware. You need to disable AutoPlay as well as patch your PC. Great analysis. It’s good to see Conficker broken down like that. It certainly makes detection and cleanup much easier. Great, I did not know about that up to now. Thanx!